Learn to create a simple ad hoc report and data service configuration against one database table in Pull Reports™. This tutorial introduces Pull Reports™ catalog configuration by creating a single report against one database table. You will learn important concepts such as what a report base table is and an introduction to table and column resource paths. Additionally, this tutorial provides example configuration in both XML and Java. Since Pull Reports™ catalog configuration references relational database tables, the following tutorial will use a fictional database called class_info which models data about an Elementary School. We will start the example report with just a single table but expand the report to include more tables through relational joins in the next tutorial. This tutorial assumes you have a working Pull Reports™ installation and are ready to create your first Pull Report. If you still need to install Pull Reports™, see the Installation Guide. Additionally, since the class_info database is just explanatory and not actually present in your Pull Reports™ installation environment, the steps in the tutorial will not work with your Pull Reports™ installation. However, the concepts within the tutorial are directly applicable to your Pull Reports™ catalog configuration. The student table will be the single, base <table> of our first report. A Pull Report base table is special. At least one column from the base table is always included in the Export Report REST API export result, and all SQL joins to other, <relationship> tables originate from the base table. In this way, the base table represents the core view into the report data model. At this point in the tutorial, the student table is the only table in the class_info database, so it is the only base table candidate. In more complex databases with multiple, related tables, you may create multiple reports with differing base tables to represent different report views. See Tutorial 4 for information about creating multiple reports in the same Pull Reports™ installation. The columns of the student table are largely self-explanatory with the exception of the home_geom column. This column contains the geographic point location (e.g. latitude / longitude) of the student's home address. This point geometry will be used in Tutorial 4 when we learn about exporting results to the kml, geojson, and map GIS export formats. A catalog may be defined as a Pull Reports™ XML Catalog file or as a Java class implementing the CatalogConfigurationFactory Catalog Configuration API interface. For simple Pull Reports™ installations, configuration via XML is typically sufficient. However, if you need to dynamically create configuration from an external source such as a database, would like to reuse configuration between Pull Reports™ installations, or you prefer programmatic, Java configuration over declarative, XML configuration, use the Java API. In this tutorial, we show example configuration in both techniques. Pull Reports™ XML Catalog files must conform to an XSD schema file found at https://www.pullreports.com/docs/xsd/pullreports-catalog-1.5.0.xsd and in the dist directory of the software media. Use the XSD to validate the XML structure. Additionally, the Pull Reports™ XML Catalog file schema documentation provides detailed help on each XML element. To browse the documentation, start with the root <catalog> element. To create your first catalog and report, create a text file named class-report-catalog.xml within the Java classpath of the Pull Reports™ installation WAR. A typical location for the file is the WAR's WEB-INF/classes directory. Secondly, reference the class-report-catalog.xml file within the catalogs installation property like so. There are several other ways to store and reference Pull Reports™ XML Catalog files. See the the section called “Catalog Configuration” within the Installation Guide for more information. A <catalog> groups one to many <report>s under a common URL path within the Pull Reports REST API identified by the <catalog> id attribute. Although a <catalog> may contain many <report>s, a single XML Catalog file may contain only one <catalog>. However, it is possible to split a <catalog> with the same id across many XML Catalog files;. The xmlns="http://www.pullreports.com/catalog-1.6.0" defines the default XML namespace. This namespace maps to the pullreports-catalog-1.6.0.xsd found at https://www.pullreports.com/docs/xsd/pullreports-catalog-1.5.0.xsd and in the dist directory of the software media. The pullreports-catalog-1.6.0.xsd file may be used to validate the XML document. Each <report> in a <catalog> defines report web services available within the Pull Reports REST API. The configured catalog and report id attributes compose a unique URL to each service. The most important web service is the Export Report REST API because this is the endpoint that exports report results from the underlying database. In this first report, the Export Report REST API is available at the following URL. The configured catalog and report id's within the URL are emphasized. The <table> element which is a direct child to a <report> is the base table of the report. 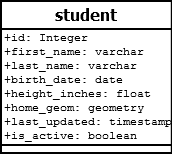 In our example, the base table uses the name attribute to define the underlying database table, class_info.student. While it is common to define <table>s with a name, Pull Reports™ also supports dynamic table definition via the <subquery> element. Every <table> must have at least one child <column> or <column_group_ref>. However, it is not required to declare <column> elements for every actual column of a database table. For instance, this example does not declare a <column> for the last_updated nor home_geom columns. Similar to <table> id attributes, <column> id attributes are important because they identify the column within column resource paths. Column resource paths are used within Pull Reports REST API HTTP parameters and other catalog configuration. In this example, the column resource path to the first_name column is /student@firstn. You may wonder why some columns specify the paramType attribute while the other columns do not. The paramType attribute is necessary to identify the column's data type in the underlying database. The default value is java.lang.String and is only appropriate for character data types. Non-character columns must have appropriate paramType attribute values to avoid type conversion errors when creating filters on the column. Additionally, the id and active columns are defined with export="false". This excludes the student.id and student.is_active values from Export Report REST API export results but retains the column's use for filtering or as a template value (see <url_template> and <placemark_name_template>). Read more about <column> attribution in the schema reference. The optional <export_config> element configures capabilities of the Export Report REST API. In this example, the defaultColumns attribute is a comma separated list of one or more <column> ids from the report's base table. The Export Report REST API will include these columns in the export result if no other columns are specified within the columns parameter. It is customary to set default column(s) which uniquely identify each base table row. The optional <pre_filter> element applies a filter condition to all Export Report REST API results. A <pre_filter> is a convenient way to exclude records which should never be exported. In this example, the <pre_filter> restricts export results to records in which the is_active columns is true. For more complex filter requirements such as restricting the export results based on user access controls, see the <subquery> element. So far in this tutorial we have used Pull Reports™ XML catalog configuration. Pull Reports™ also provides a Catalog Configuration Java API. Objects in the Java API are named and attributed similarly to the analogous XML elements. For instance, a <report> in the XML configuration is analogous to a ReportConfigurationBuilder in the Java API. The following CatalogConfigurationFactory returns the same configuration as does the class-report-catalog.xml file. This concludes Tutorial 1 in which we learned the basics of Pull Reports™ catalog configuration. Continue to Tutorial 2 to extend the report data model via <relationship> configuration.